Over the past few weeks, I’ve been thinking about and looking at how to make repeating patterns. I’ve tried the old fashioned way of working on paper and cutting the paper and so on, and not found the results at all satisfactory. I’ve had a bit of a go in Adobe Illustrator, but I find Illustrator so confusing and frustrating to use. There seems to be a total disconnect between my brain and the software architecture of Illustrator, and other similar pieces of software. A day or two ago I found a little app in the Microsoft Store called Amaziograph that lets me create repeating patterns in sheet form, which is great if I want a sheet of black and white repeating, entangled line art, but not what I want if I want a coloured repeating pattern. Oh, the app is a lot of fun to mess around with for sure and no doubt I will use it to generate patterns. Looking around at software today, a lot of it either works in Illustrator or is prohibitively expensive given that I just want to have a play, see what I can come up with and see if it’s something that I’d like to spend more time with. Where they offer free trials, I know they’re not going to be a long enough trial for me to get to grips with Illustrator and the software/plugins, so I’d not be able to make my mind up. So, on a wander around the corners of Google, I found a lovely little program called Repper. It had an online trial version that I could play with quite happily, and I decided to purchase it afterwards. In Repper, you open your own artwork and use parts of it to create repeating patterns. The pattern above is an example of that, kind of. What I did was to take one of my coloured mandala patterns and use that to create a pattern that was pleasing to me. Actually, I had many, many patterns that were pleasing to me, and I saved them as tiles that would form a repeating pattern. With some, I saved them as a surface pattern, where the tiles were already repeated. What is nice is that the program lets me set both the size and quality of the tile or surface image. Next, I put the tile I particularly liked into GiMP (GNU image Manipulation Program, open source software) to copy the black lines and create a new, uncoloured tile with a transparent background. Autodesk Sketchbook Pro was my next destination so that I could colour the tile as I liked. Not so easy where the edges of the tiles will meet and to have no edges showing up. The tile is partly finished in terms of colour, but I wanted to see how it would look tiled. Go, back to GiMP I went and the above was the result! My head now hurts a little after this, which means I need more tea, LOTS more tea and a bit of a break. I absolutely love that I can take my artwork and use it to create more interesting designs and patterns with. It’s absolutely fascinating, very easy to get lost in it all. Definitely a very nice way to spend a few hours on a chilly and very rainy afternoon! My Surface Book and Surface Pen have had a good workout in the process too! I used Autodesk Sketchbook Pro on my Microsoft Surface Book along with my Surface Pen to add patterns and shading to two of the butterfly outline designs I drew yesterday. I’m happy with the results. Today I’ve also created two more dot mandalas, each around 5″ in diameter. I added some gems to those, as well as to the small dot mandalas I created over the last couple of days. The sparkle really adds something special to them, and helps to emphasise the circularity of mandala designs. It’s been a long half-term at school; eight weeks to be precise. In that time there’s been two training days, a twilight training session. a memorial walk to raise money for school funds and the Senghenydd Mining Disaster Memorial, almost daily incidents of poor behaviour/attitude to deal with, lessons observations, book reviews (as in how well and regularly work is being marked), a consultation with my union representative, a stress-meltdown and hopefully the end of three year period of what feels like persecution/bullying in a particular situation at work (culminating in the union consultation and the stress meltdown). I still have a pupil to be dealt with who has been making threats to physically attack me because I apparently ‘start on him’ by asking him to do his work. How shocking is that, that I should request he stop shouting around the class, distracting others and to do his work? Oh the joys of being a teacher. Having said that, there are joys. The shared smiles and laughter with pupils enjoying the lessons. The ones whose faces light up when they see me and who never exhibit poor behaviour in my class, even though they may do in other lessons), the shared laughter with colleagues, morning breakfast with ‘the girls’, the helpfulness of the lab tech, the enthusiasm and questioning of pupils because they are interested in something, their kindness and thoughtfulness. And so much more that it’s a shame it can become dominated by the negative things that occur and dominate my ruminating, over-analysing, over-thinking brain. It’s been really busy for me with having to prepare work for a new course I’m running with my special needs classes, as well as teaching mainstream classes that I’ve not done for years. It’s meant late nights at work and even bringing work home – something I avoid doing as I do not want to go down the route of being a workaholic as I was in the first decade or so of my teaching career. This busy-ness has really eaten into my creative time. Little art has been done, and I’m am doing my best to settle back into it in this half-term, especially as I have two contracts to create artwork for two books, though I have been waiting for direction for what the artwork is to be for a long while now. I’ve barely stopped in the first four day so of the half-term. I seem to be running away from time with myself. I can struggle with being alone, feeling lonely and end up keeping moving, moving, moving to avoid it. Today I am remaining at home and trying to get things out of the way so that I will settle to some arty pursuits, or de-stressing after the last half-term. I do seem to be a lot more resilient than I was a year ago. Though things can get to me (such as loneliness, lack of a sense of belonging, the constant worry I’m doing things wrong that have precipitated the situation at work that led to a stress-meltdown), I often find there’s a content ‘centre’ in me that I can access when I do things of a creative nature or things that focus my mind away from it’s rumination and negative thinking. It’s a little easier to spot when this is happening, though I don’t always catch it in time to stop the tears, the self-loathing and the comfort eating. I rejoined a choir I’ve been a member of since I was in school myself. Sadly, I had to leave again once the stress levels rose as my voice was, and still is, affected by the stress. Out of all of this, and at odd times during the last couple of months, I have managed to do some arty things. Here’s two mandalas of mine. Anyway, this mandala has been created using Unipin pens, coloured pencils, a Pentel white hybrid gel pen, and gold and silver Sakura pens. Yes, there are some very subtle metallic highlights on this one that don’t really show up in the scan. Yup, it’s the eighth one in the series this month. 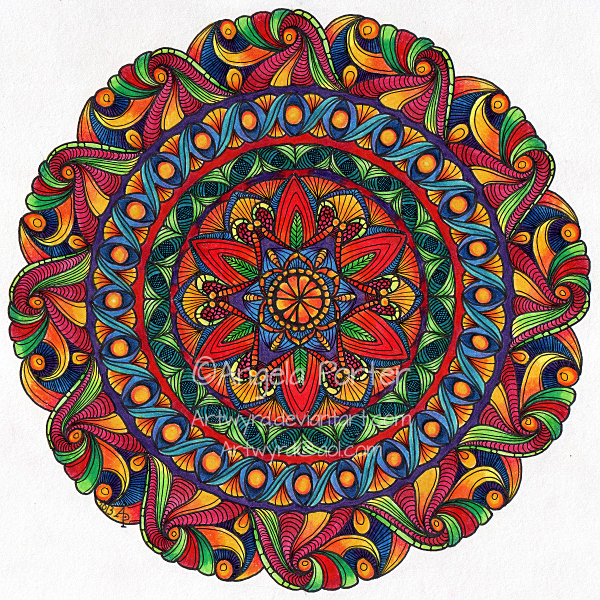 I really have become hooked on mandalas this past week or two. The repetition that’s necessary to complete them (well it is the way I do them) is calming and meditative; that’s not just for drawing the outline, or for the colouring, but for all the texturing as well. This one uses a rather unusual, for me any way, colour palette. The background has been left white as I really don’t know what colour (or texture) to do it in. Do I do earthy greys and black, rich earthy greens, blues the hues of autumnal day, twilight and night skies, or some other colour(s) that I’ve not considered yet? It will come to me, and any suggestions are always welcome! And here it is with a background. I’m ambivalent about the background; part of me likes it, part of methinks the colours are too similar to the mandala design, part of me wonders if I should have played around with colours more, and part of me thinks that the texture on the background should have been done in a copper metallic ink with dark inner shadows. This is approx. 7.25″ (18.5cm) in diameter. Black Unipin pens and polychromos pencils on heavy, acid-free cartridge paper. It took two episodes of Criminal Minds to do the pencil pattern and then to go over it with ink. Another three or four episodes to complete the colouring, and another one or two to complete the texture lines. I’m enjoying doing these; they’re very calming and meditative to do as there is a lot of repetition in producing the finished piece as they are geometric in design. Yet another mandala…number 6 of the month! This is approx. 17.5 x 17.5cm and was created by me using UniPin pens, Zig Art and Graphic Twin pens with water as a wash, coloured fineliner pens and coloured pencils on acid-free bristol board. Art is my solace, even though at times I’m doing the work through tears. Today was one of those days. I’m really struggling with the inner critics who are beating me up so badly at the moment, and despite me trying my best to quell them, to soothe them, they are currently stronger than I am and are winning. Art has soothed them a tad…just a tad. Some days it’s hard to find anything to be proud of about myself, to feel I am as important and matter as much as every other person on this planet, that I’m a good person, a kind person, a caring person and so on. On days like these, days like today, creating something pretty through my art reminds me that there is something in me, about me, that appreciates pretty things and can create pretty things and so there must be something pretty or even beautiful within me. Astrologically pinks and greens belong to Venus, the planet of love, beauty and harmony, romance, relationships the urge to empathise and unite with others, pleasure, joy and sensuality. The lilacs and sea-greens belong to Neptune, the planet of dreams and fantasies and helps to dissolve boundaries and change existing rules. Neptune can also result in confusion, and confusion is often experienced during profound and/or subtle changes in thinking, rules, beliefs. Change is never easy. Interestingly, both planets are related to artistic pursuits and aesthetics and our own personal tastes. Maybe … or maybe it’s just pretty!